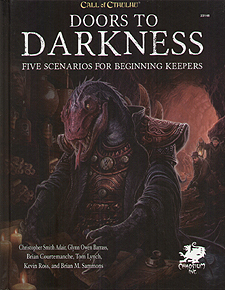 Door To Darkness provides five scenarios written especially for beginning Keepers and players of Call of Chthulhu. Here you will find horror, mystery, investigation, ghastly monsters, strange magics, and forgotten secrets, as well as plenty of advice about how to run the adventures for best effect. As well as the scenarios, an essay by Kevin Ross details a wide range of hints and tips on running Call of Cthulhu - guidance any Keeper, new or experienced, will find very useful. The Darkness Beneath The Hill - A friend's house renovation project leads to unexpected discoveries in Providence, Rhode Island. Genius Loci - Not all is well at Danvers State Lunatic Asylum and it's down to the investigators to heed a friend in need's cry. Ties That Bind - Strange rock formations have been found in Mrs Carrington's prized fountain. But these are like no rocks seen before! Also included are ten diverse and ready to play investigators, allowing players to dive straight into the mysteries contained within Doors To Darkness. Lastly, just because these scenarios are written with new players in mind, don't expect them to be a walk in the park! Those who dare to open the doors to darkness will discover just what secrets and danger lie within!